On Saturday, 11th January 2017, Form 4 students went to Kabete Rehabilitation centre situated on Lower Kabete. 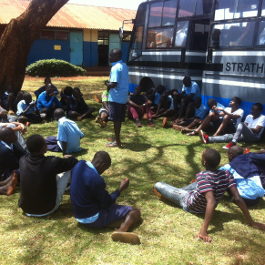 The group comprised of 61 students and four teachers namely Mr. Karani, Mr. Onyango, Mr. Kerongo and Mr. Maina. A good number of those absent were representing the school in a basketball tournament in Upper Hill School. Kabete Rehabilitation Centre is a government run institution with a current population of 62 pupils and 26 members of staff. This is a drop from 2016 by almost 50%. The population will go up during the course of the year when the new batch of students is dispatched. The institution is considered a medium risk institution since it accommodates petty offenders between the ages of 11 to 17 years who are sent by the Children’s courts. It offers primary education for classes 5 to 8 and also vocational training such as tailoring, masonry, cookery and metal work. We were received by Pastor Stephen Nganga, who was on duty, in the company of five staff members and the 62 students. This reception took place in the assembly grounds. Sports was the highlight of the day with a captivating football match that ended 3 – 0 in favor of Strathmore. The class managed to donate the following items: tissue, bar soap, toothbrush, petroleum jelly, maize flour, wheat flour, cooking fat, cooking oil, sugar, salt, rice, green grams, beans and other cereals, slippers, shoes, exercise books, pencils, baking powder, tea leaves, revision books, milk and mangoes. At around 4:35 pm, they arrived at School safely.